I think the Daily Mail may have been responsible. Yes, seriously. I was on a ‘plane home from somewhere and asked for a newspaper and was given a 3-day-old copy of the Mail. Old news is no news and so I quickly moved on to the Puzzles page. Amongst a wide selection, I found a simple dissection problem of a square into two heptagons…which pointed in opposite directions. The cruciverbalist’s brain rarely switches off and I thought this must have potential. Vague prepscholic memories of Westward Ho! somehow came to mind; I’d read it some 40 years ago but couldn’t really remember much of the plot. Uncle Wiki helped fill in the gaps and produced the basis for the puzzle. I really liked the idea of one arrow carrying Amyas Leigh westward and then him returning homewards with his new-found Indian sweetheart. And so it began. I’ve checked my files and there were six grid attempts before the final version emerged; and, with each new grid, I seemed to be able to incorporate more and more of the key elements of the story, and also offer some help to the solver as to the shapes required. I had thought about a clue device but, perhaps a little wickedly, there was something inside me which wanted to have the endgame all come after the grid had been completed. To compensate (in a way), maybe I could include vaguely thematic surface readings in some of the clues? Or perhaps even a direct hint to the theme (or at least the location of the story)? I usually draft a version of the preamble before embarking on the clues. And then come back to it — normally several times to get the wording right — as the process progresses. Then testing (thank you to both of you), some clue and preamble modifications, and then sending off to the Editors, acknowledgement, then the long wait. (It’s not really such a long wait but it always seems like it is.) Murmurs of a positive response at one get-together, then confirmation that I was getting near to the top of the pile. As ever, there was some “tweaking” required and a few of the more outrageously Artixesque ideas had to be toned down or were just flat rejected. In every case, I am sure the final version was fairer, if perhaps not so innovative. Of course, there was a little bit of the habitual to-ing and fro-ing, gentle arm-twisting to keep the surface readings sound, even mild persuasion to accept my originals. Quite genuinely, I thank them for their input and their patience and their tolerance. I am also flattered by the positive response that the puzzle has received from the majority of those who have commented. It’s always most encouraging. Thanks. Artix’s crosswords are usually very challenging – none of the ‘Stripey horse (5)’ clues for him, but this week’s clues were not desperately difficult and we soon had a complete grid. It was not the grid fill so much as the wealth of material that was hidden in that apparently innocuous little 12 x 12 grid that was exciting. Of course I started with that check that he retains his entry ticket to the Listener Setters’ Topers Outfit, though I didn’t really need to check, as, since we are members of the Rasputin setters trio, we are usually at the same table at the setters’ dinner and share our taste for the fine reds. I had to read a long way down his clues before I reached ‘Sensational bit of aroma overlooked by winemaker (4)’ A confession here, this clue gave us a slight advantage – Artix lives on the south side of Lake Geneva and we can see his dwelling place from our north side and what is the local red wine? Gamay, so we removed just the bit of Aroma from that and had GAMY = sensational. It wasn’t the grid fill so much as what followed that had the Artix touch. The other Numpty confirmed that there was only one ‘heptagonal’ shape that would leave pieces that could be reassembled to form a second heptagonal shape that was a reflection of the first, and that that was an arrow. Therefore, we had an arrow shape, heading west that encompassed the hero, and, sure enough, there we found, heading west, AMYAS LEIGH. First pdm. The theme was Westward Ho (second pdm – the title said ‘Follow the Directions’ – we were indeed doing that but so was he – going WESTWARD HO) We had to check with Auntie Google and she told us that his first love was ROSE SALTERNE (4,8). Cutting that initial arrow from the grid did indeed ‘break her up’ but not so evilly as the Inquisition in the novel who burnt her at the stake! We fiddled with those left over pieces to create the second, reflected arrow and found, to our delight, that ARROWHEADS now appeared in our grid, crossed by WESTWARD HO. Fortunately, I was using an eraser pen as Amyas Leigh’s second love, AYACANORA was in our re-constructed grid, but with a U that needed to be adjusted with love (O) to give her correct name. What’s more, like Rochester in Jane Eyre, Charles Kingsley’s s hero is blinded at the end of the novel. It must be some quirky form of romanticism that thinks that the heroine will be blissfully happy with a blind husband. However, we had to obey instructions and remove him ‘as on his journey he has become unsighted’. Truly an astonishing construction and great fun. Congratulations to Artix! The golden Poat HARES? I wouldn’t expect to see many of them off the Caribbean coasts of Venezuela even though Amyas Leigh was apparently seeking gold there but, sure enough, there was a veritable chain of the beasts, with yet another becoming ‘unsighted (well, decapitated!) when we blinded Amyas Leigh. So you know what came next? A bit of grid-staring, of course. I suspect that anybody who’s a competent mathematician probably knew what sort of 7-sided shape we must be talking about. It was obviously not restricted to the lines of the grid as that would, I think, always produce an even-sided figure. I was beginning to toy with a sort of diamond when I saw the ARROW of NARROW at 28dn, and there at the top of the column was HEAD + S leading to ARROW-HEADS. Kerching! 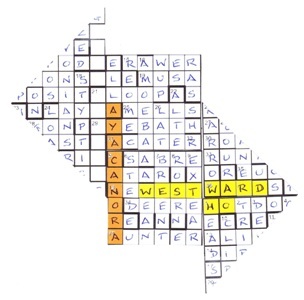 It didn’t take long to see WARD and HO crossing that description of the arrow-shaped figure, and WEST was at the end of row 3. I decided to park that idea for the time being and see if I could find the hero and his first love. I got slightly side-tracked by SALEM, USA in row 5 and PONGO in column 2, but LEIGH in column 6 looked promising. However, AMYAS seemed a bizarre first name, so I continued and found ROSE SALTERNE in column 11. Never having read the novel, it was time to resort to Google and check to see if those two characters meshed with WESTWARD HO by Charles Kingsley. And so they did. And so also did he have a bizarre first name (much like today’s celebrity offspring). After that, it was straightforward to cut up a copy of my grid, create the two arrow shapes, and then stick them together to form a ten-sided figure with AYACANORA visible, once AURA was changed to AORA. Thanks for an entertaining puzzle, Artix. It’s always nice when some detective work is required to find the correct solution. First of all, thanks to Artix for a very cleverly constructed puzzle. Is ’SABRE-TAUNTER’ a suitable description for a Listener crossword? The labels on the top and bottom initial grid rows of this excellent puzzle by Artix appear to suggest Yes! really appealed – probably for the apparent mundanity of its surface. Being parsed as STEREO ME. needed a memory jog to apply SP (sine prole, without issue), then add ON SAL(e). looked like the definition would be ‘Runs’ and the answer EXTRAS but it took me a while to parse, largely as I didn’t know the meaning of TRASH that is splinters (and thus splints). So EX TRAS(h) it was. And would you include the ‘!’ in the letter count? Or would you do something else entirely? Anyway, back to the plot. I had two early ideas – one much brighter than the other. And boy, was one dim, so that’s not saying much! The heptagon, given its odd number of sides could readily be shown to not entirely follow the gridlines – as that would result in an even-numbered shape. So there must be some diagonals. However, I then looked at the AMYASLEIGH in a column and thought, “That could easily be a mast, it must be an image of a sailing boat, that’s how he embarked upon his journey.” And that was my downfall – in terms of wasted time. I drew multiple different configurations of two-sailed boats. I could make the sails fit half the space easily but the hull was a nightmare, as I couldn’t get the parts of WEST-WARD-HO to all properly come into contact. So I tried looking for AYACANORA instead and was delighted to find it in three 3-letter parts, with all but one O, in Column 7 – as AYA, CAN and URA. At this stage I still hadn’t cottoned on to the fact I was looking for arrowheads, let alone that the first should be pointing Westward, so I worked out the simplest cuts I could get away with to ‘free up’ AYA, CAN and URA – and suddenly things began to become clear. The ‘pun-meister’ reputation that Artix has long been building luckily led me quickly to reading ‘love restored’ in the Preamble as meaning change the URA to ORA. The theme haunted me for some time but exploiting it to Ximenean/Listener standards was a Sisyphean task in itself, and the final least/worst option was not wholly to my taste. So it was rather a surprise, and very gratifying, that it gave considerable pleasure to a large number of an above average entry.